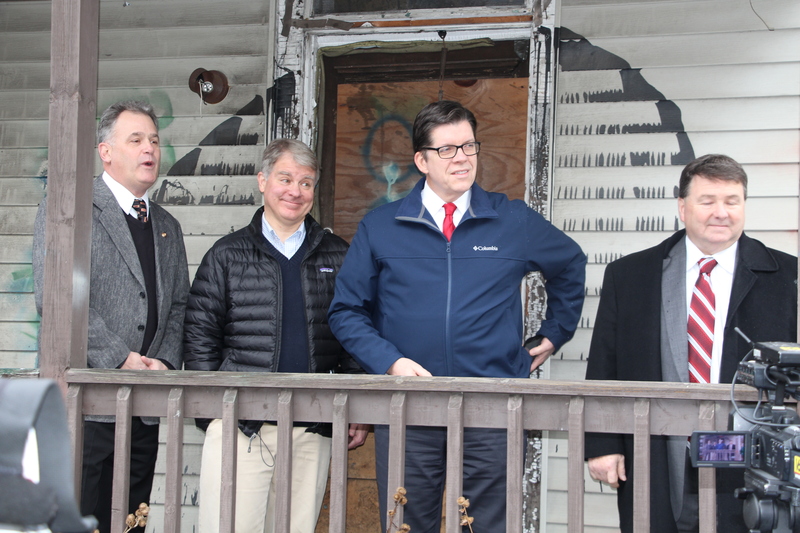 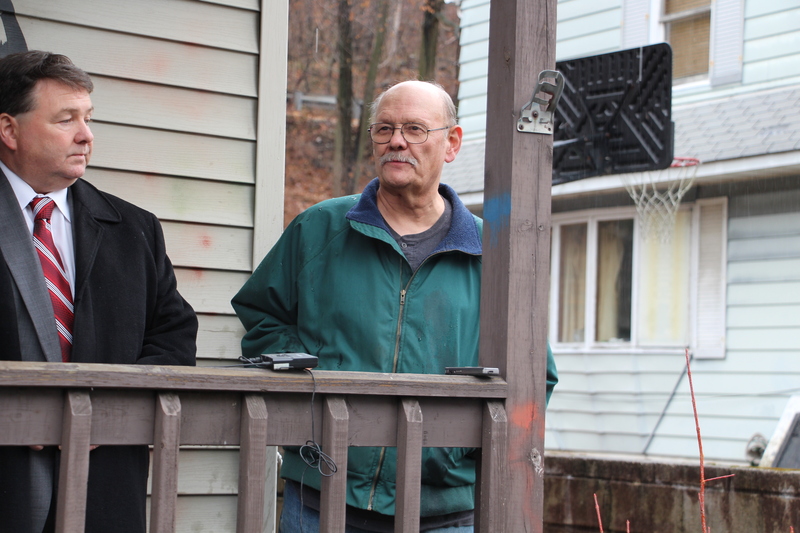 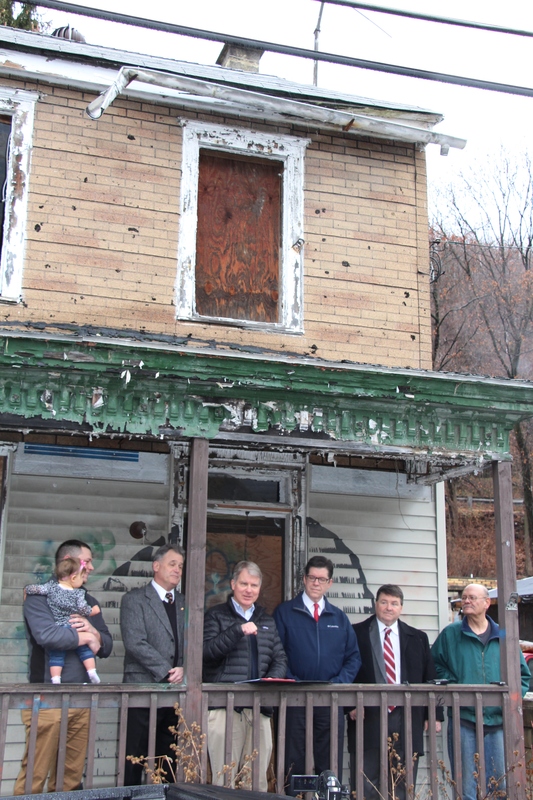 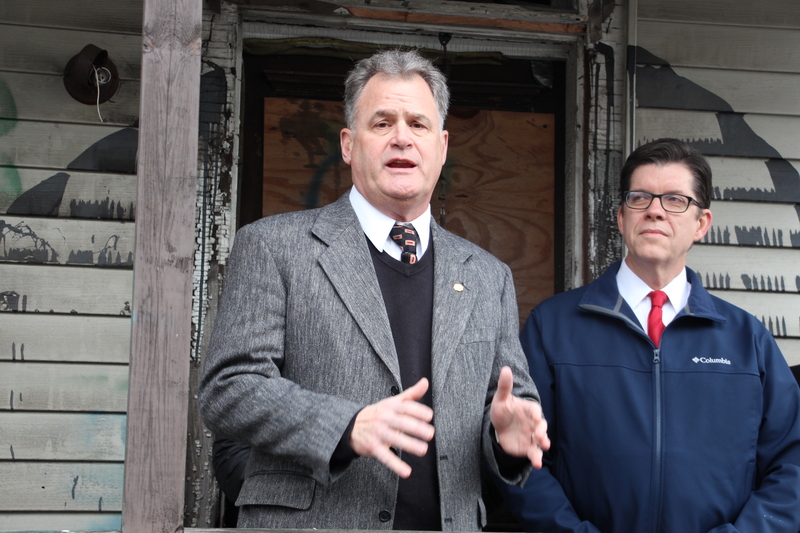 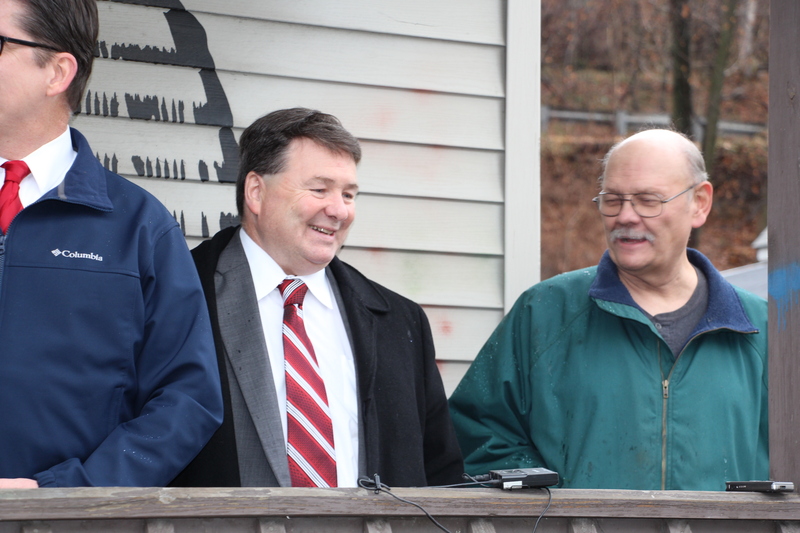 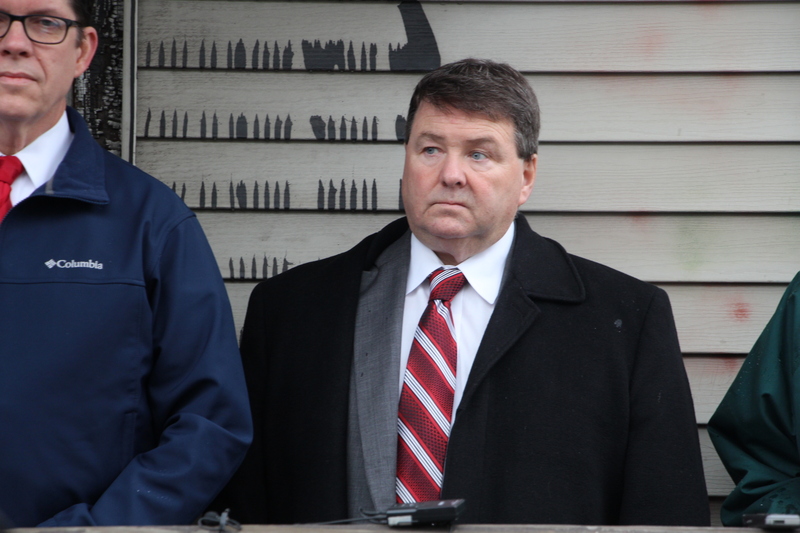 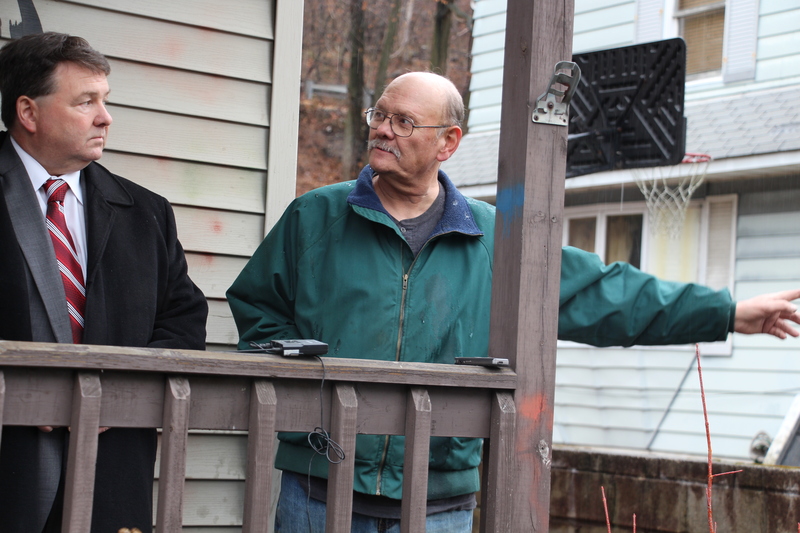 Standing in front of a crumbling property on the 100 block of West Ogden Street in Girardville (Schuylkill County), Senator David G. Argall (R-Schuylkill/Berks), Representative Neal Goodman (D-Schuylkill), and Schuylkill County Commissioners George Halcovage and Gary Hess announced $1.4 million in state funding for demolition projects in Schuylkill County. 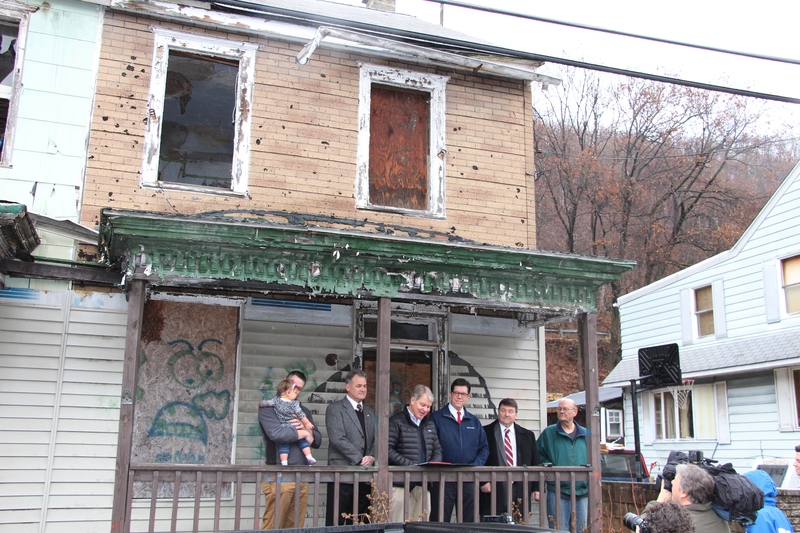 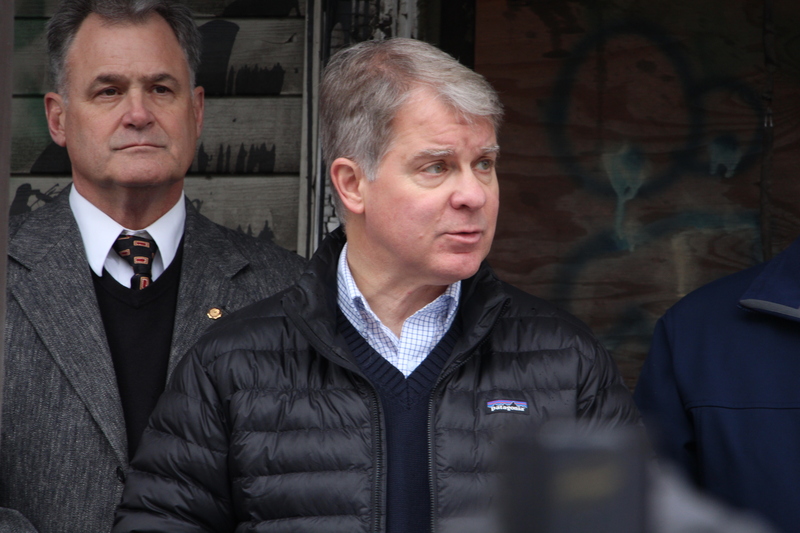 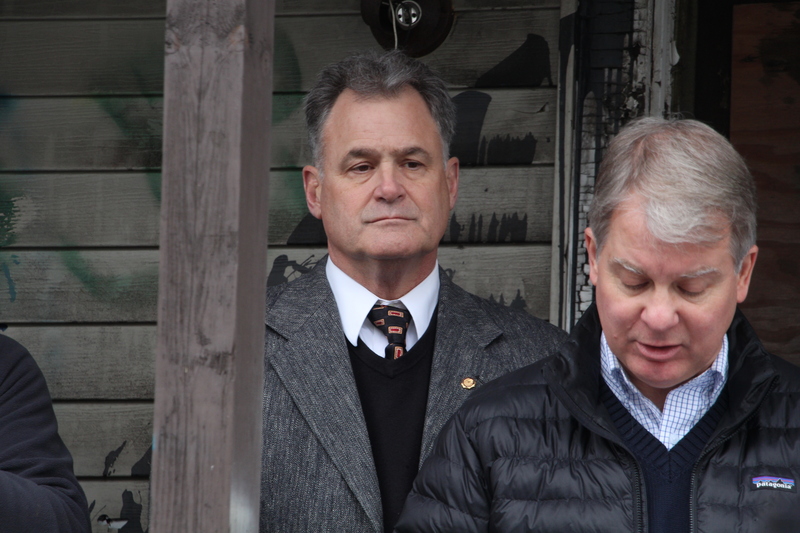 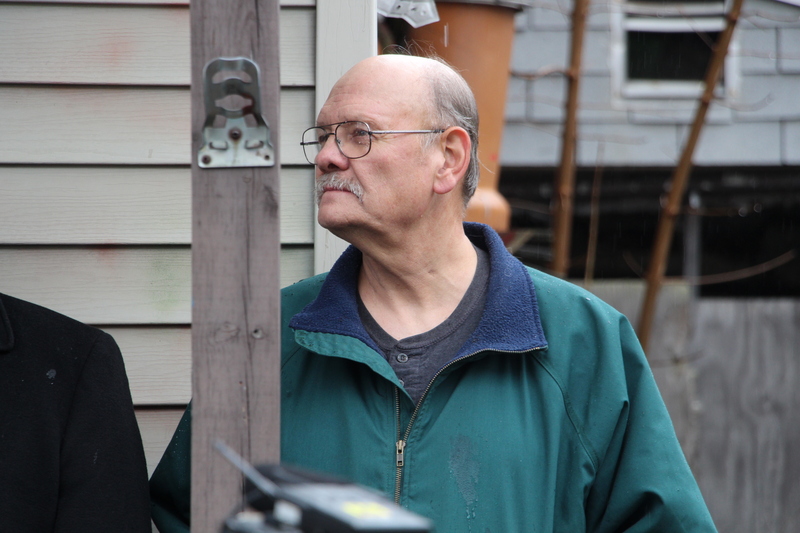 This huge shot in the arm will allow the county to bring structures down that are in disrepair, like the one behind us,” Argall said, pointing to the dilapidated structure behind him. 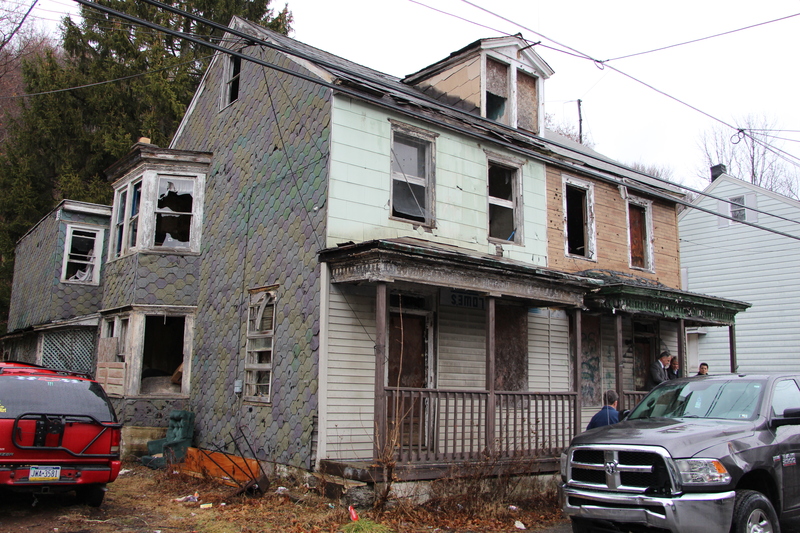 The officials said the $1.4 million award from the state will provide demolition dollars sorely lacking in the county. 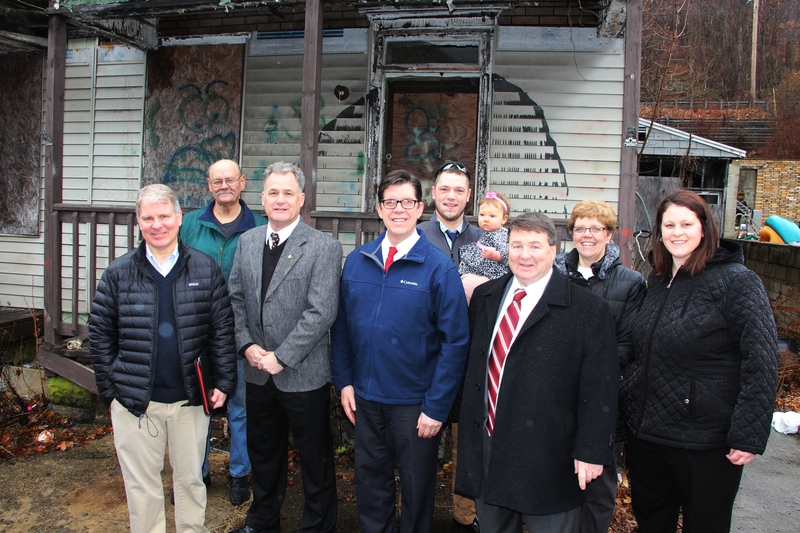 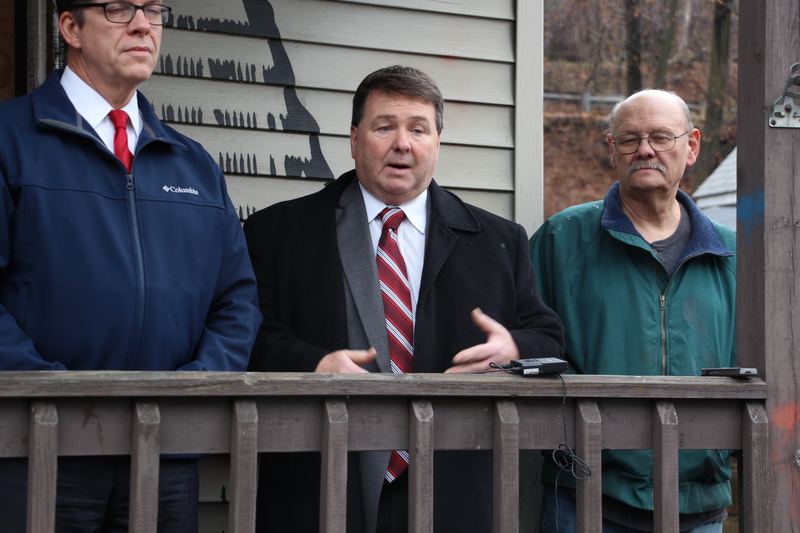 “I’m sure our communities will put this much-welcomed funding to good use, as this is a perfect example of state, county and local governments working together in addressing this challenge of removing blight within Schuylkill County”, stated Halcovage, speaking on behalf of Schuylkill County Board of Commissioners. 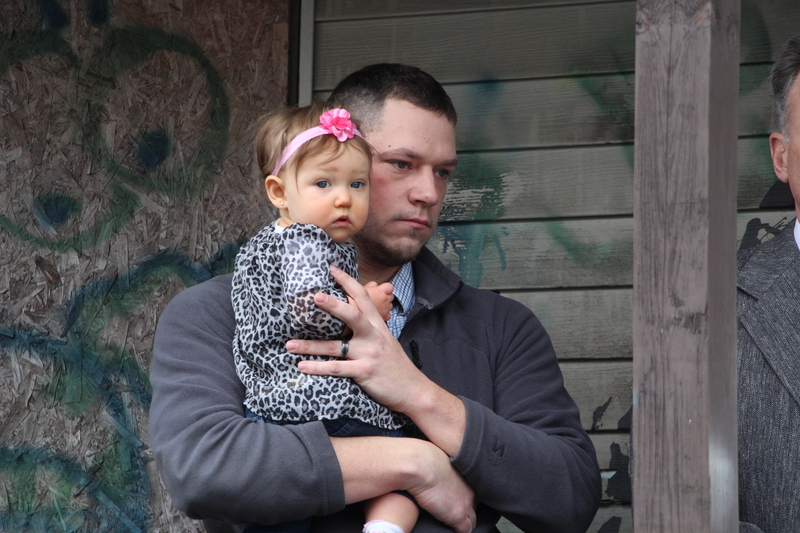 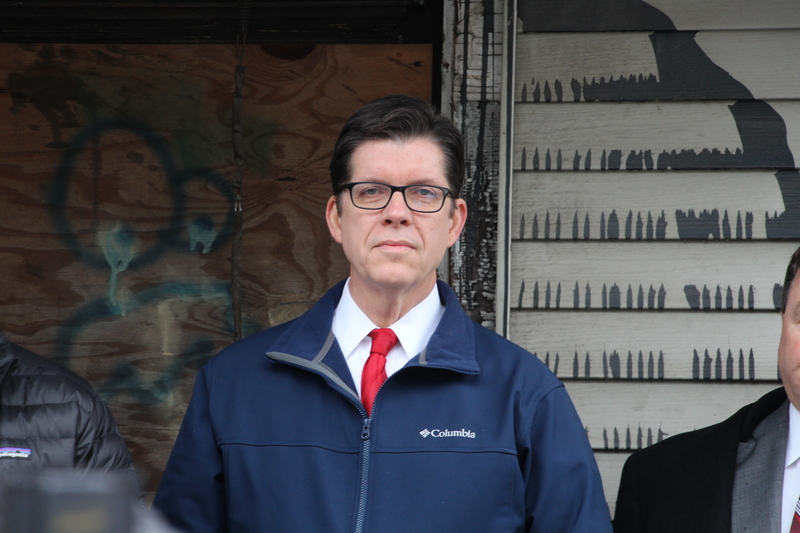 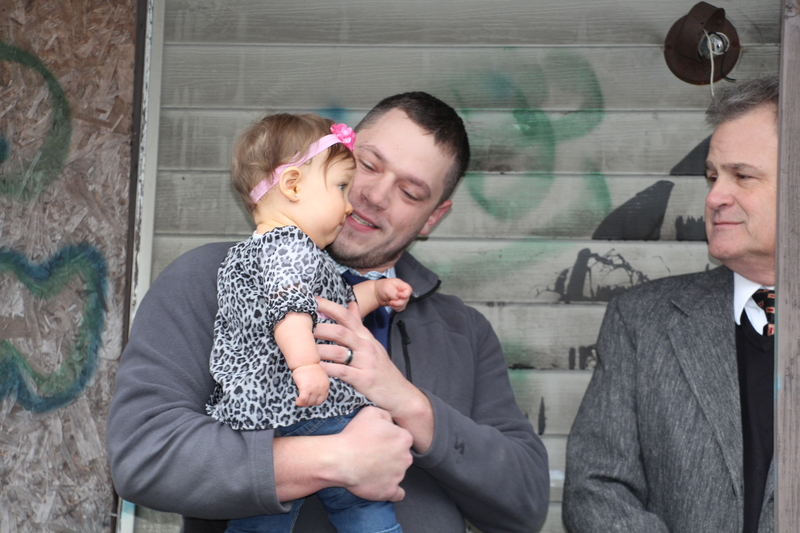 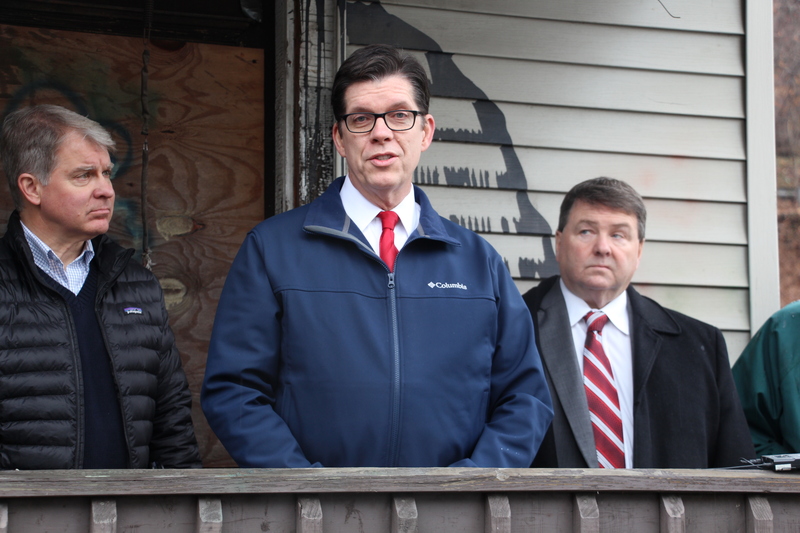 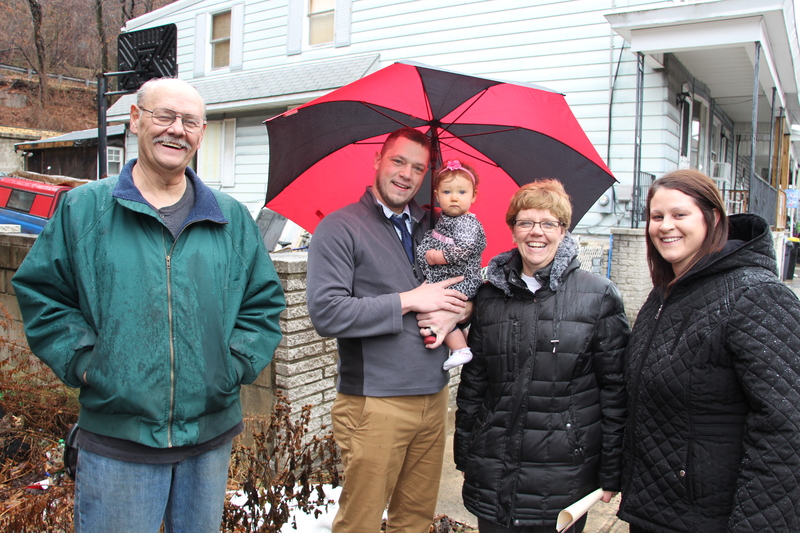 “Blight can be a cancer in a community, driving down the value of neighborhood properties, serving as a haven for criminal activity and giving the impression a community’s best days have come and gone. 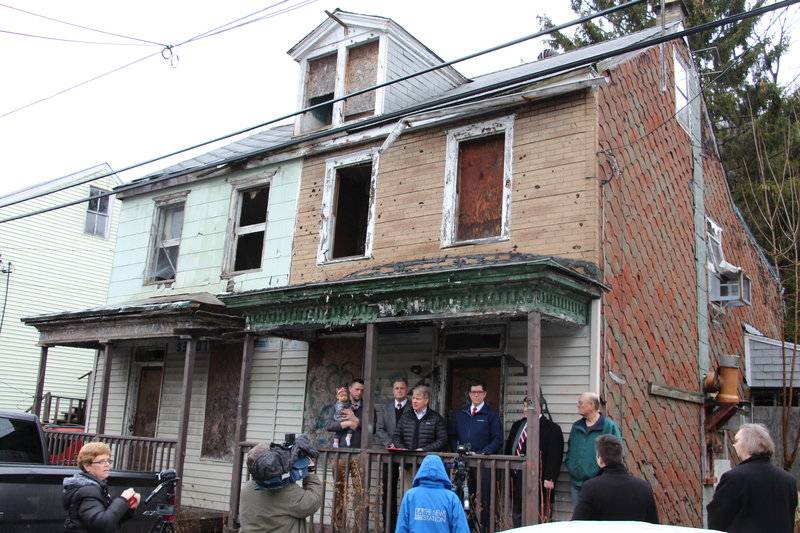 There are many ways we can attack this problem, but having funding to raze run down properties is the best antidote,” commented Goodman. 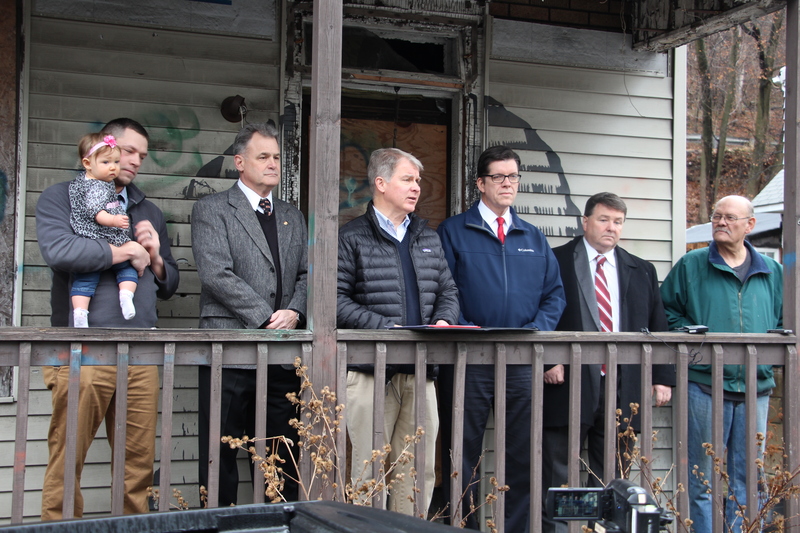 Argall said the key is working together as a team to come up with solutions for the betterment of the county. 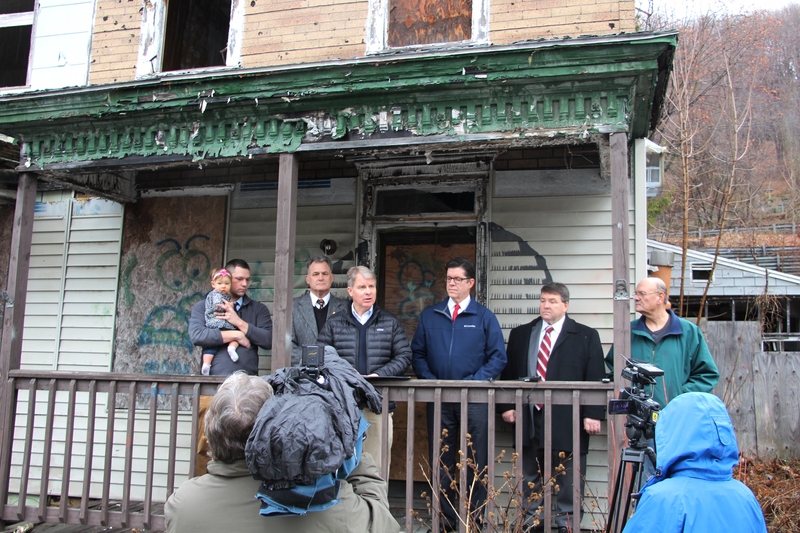 The ultimate goal is to rebuild on these sites for future housing, employment or other positive opportunities. 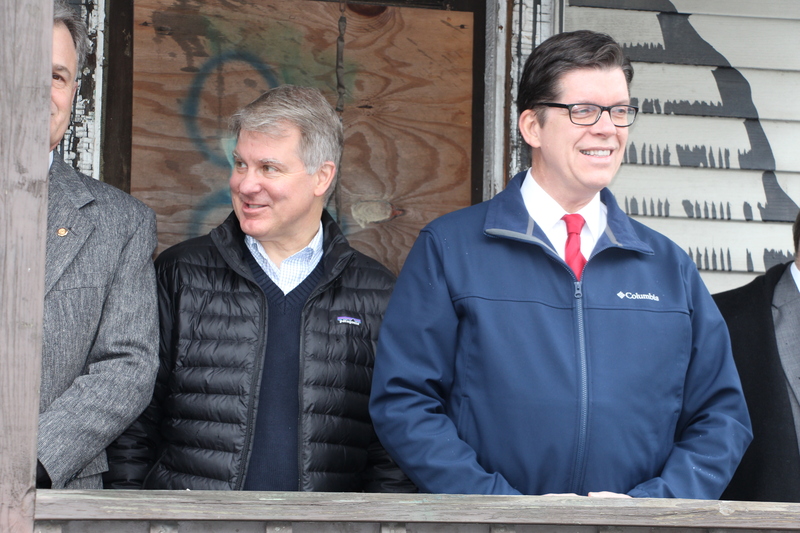 “We keep an open line of communication with our communities, which is critical so we can support and offer suggestions at the state level that will translate into tangible results at the local level. 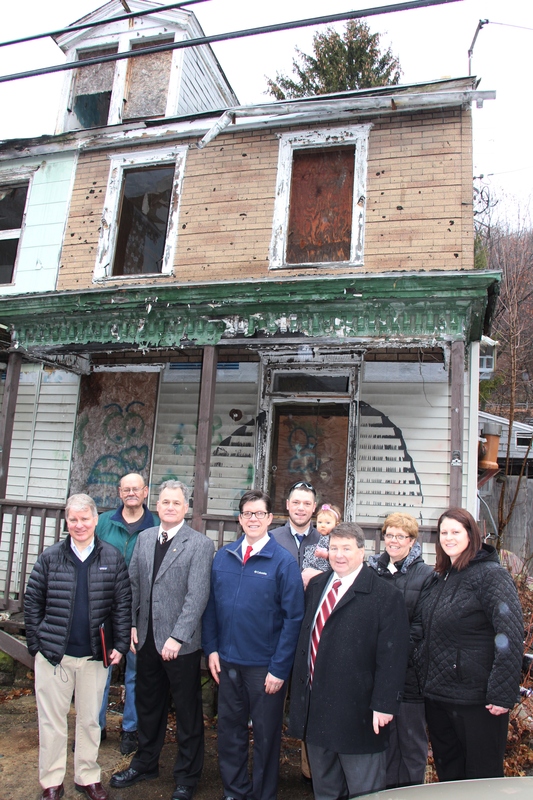 This is very much a team effort. 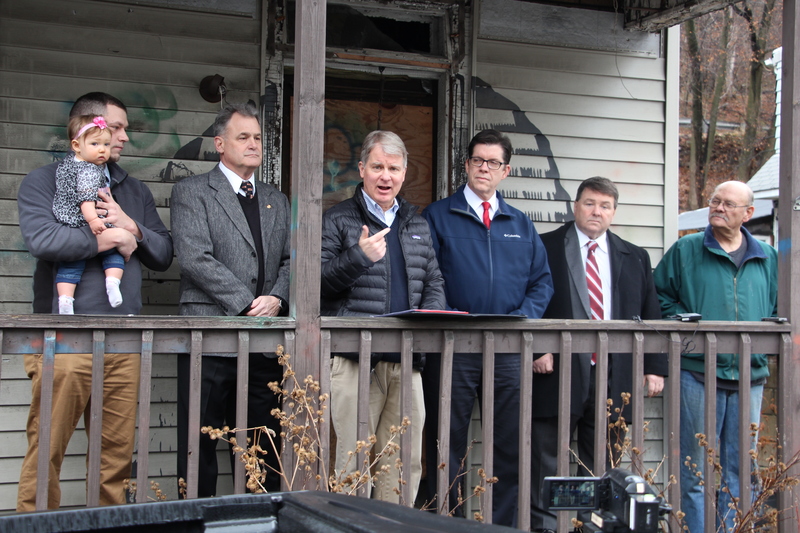 It has to be if we want to be successful in ridding our county of blighted properties,” Argall said. 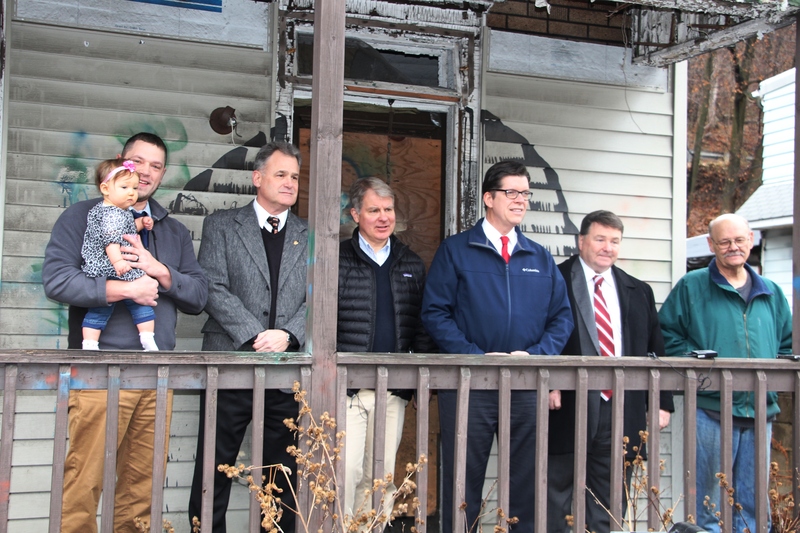 Other officials on hand during the announcement were Girardville Mayor Joe Catizone, council vice Rob Krick, staff assistant Mary Beth Dougherty, Schuylkill County compliance officer Michelle O’Connell. 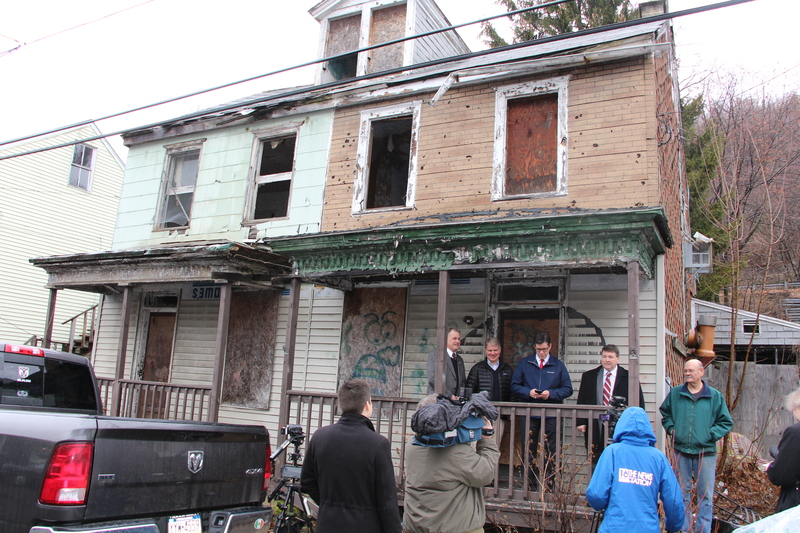 All of which are also on the borough’s blight committee.